I have taken up position in the seating area of Coffee Guru in the Canberra Centre. Good coffee, friendly staff, and within Apple Store WiFi range. Perfect. While I’m back in Canberra, like last time, I don’t propose to blog much. Firstly, I see this as a kind of break from my travels, and secondly, out of respect for the privacy of my generous hosts. I will tell you about Thursday though, not that it will compete as the most riveting read of the whole trip. I’m about to leave Tasmania. I have half an hour to pass before checking out of the Fountainside Hotel (which I can’t recommend highly enough – if you’re visiting Hobart, this is the place to stay) and catch the ‘Airporter’ van. I thought I’d take the time to tell you about my leisurely day yesterday. It’s a pretty bold claim, applied to all their street furniture and signage, but I’m certainly not in a position to doubt the good people of Tasmania’s capital. Regular and attentive readers, and I know there are simply droves of you, will realise that there is some catching up to do. The last substantive drivel I wrote was about Sunday, the start of this brief period of being left to my own devices. I think it is fair to say that while I’ve been on my own, the pace of ‘doing things’ has dropped off, but I reckon I’ve found plenty to occupy my time here. Monday was always going to be an odd day. Days when there’s a longish period between checking out of a hotel and onward travel always are. The Parkview were, of course, very helpful in having an efficient bag check system (oh, and breakfast on Monday was a much quieter affair after the scrum of Sunday morning). I had about seven hours to fill, so on the tram, into the city and coffee. I had a minor fluster when the Town Hall SBs appeared barricaded-off, but it turned out it was only to allow window cleaners to work above and access – for the determined few – was via a side entrance cunningly hidden in a car park. This particular SBs was important to me as, despite their ‘free’ half-hour-per-drink WiFi, it is located below the Westin hotel and their free lobby WiFi is accessible – and it is quite quick. This allowed me to do some plotting and planning for the day. Sunday’s jaunt to St. Kilda had worked out so well I decided to repeat it, or at least a variation of it, taking the No.1 tram to Melbourne South Beach. In considering a trip to the beach in late May in Australia, it is important to think of it as being late November in the UK. In other words, very much out of season. Even so, the sun was trying to break through the grey clouds and it certainly wasn’t cold or otherwise unpleasant. I walked along the front, past the various cafes – some of which were open but most closed for the winter – heading south toward St. Kilda. When I got to St. Kilda I headed inland along Fitzroy Street. This took me to the south end of Albert Park (the park, as opposed to Albert Park, the suburb, which I’ll come to in a moment!). Carl had pointed this area out to me as we first drove into the city as I understand the park’s peripheral road – most of which is open to the public – forms the Melbourne F1 circuit. The central feature of the park is a rather large lake, which is very appealing to the eye and teeming with bird life – and lots more joggers! This was another 2.6km, end-to-end, so I reckoned I was turning into Chappers with all this walking. I found the bookshop, and more importantly, a bakery for a sandwich to keep me going as it was 14:15 by then. After exploring round there a bit, I retraced my route back to the hotel and collected my bag. Time was still on my side as I got off in the CBD to switch trams to the 109 out to Port Melbourne. So I stopped off for a farewell Australian Starbucks (this will be my last one until LA!). The ride out to the Port was marred by a loud and slightly threatening (russian sounding) drunk. He stayed away from me and other than being deeply unpleasant, didn’t actually do any harm. When we got to the Port, I last saw him urinating on an ATM. Gives us drunks a bad name. Boarding for the ferry didn’t commence until 18:00, so I had a bit of a wait in the departure area after checking in – hence the brief post on the blog. Once on board, I promptly got lost, not knowing my stern from my bow! Eventually I found the ‘Ocean Recliner’ area and set up camp in my allocated seat of B09. As seats go, they’re better than economy aircraft, far worse than Business Class on SQ’s A380 (!) and pretty much on a par with the Indian Pacific – though the seats don’t squeak quite so much when people move in them. I went and explored further, finding the bar one deck below and was delighted to discover it serves three different variety of Moo Brew craft beer from Tasmania. During the course of the evening I sampled all three and went back for a second Dark as I enjoyed it so much. I decided not to bother with the Captain’s Table restaurant, and filled my dietary needs with the ubiquitous beef pie from the bar. I’m not sure if it was all the walking or, more likely, the rhythmic rock & roll of the ship (which got much more noticeable as we left the bay and entered the Bass Strait at 21:40, 2hrs 20 min after we set off, such is the size of the bay), but I turned-in for the night at 22:00. Even by then, the bar had pretty much emptied, the main contingent left being a group of about a dozen people of, er, ‘alternative’ appearance. I was somewhat alarmed to become engaged in conversation by one of their number when standing at the urinal as I left the bar. Turns out they’re a British music group on tour. I didn’t ask who they were, but in the course of the uncomfortably long conversation I learnt that Derby Assembly Rooms is great venue for a gig!? Oh, and talking of maps, Carl sent me this – which I thought was pretty impressive …. I endured a fitful night’s sleep. The ship is far from full (one of the upper bars didn’t even open as, evidently, there wasn’t enough business) so I was the only occupant of my row of four seats, which helped. Though leg room is ample, when fully reclined, the seat in front pretty much pins you in. If anyone was occupying the adjacent seat, you’d be trapped for the night. It would be bad enough walking a loved-one up in order to attend to nocturnal needs, but imagine if it was a stranger. Similarly, when reclined, your head enters the personal space of the people behind you – one of whom I quickly discovered had appalling halitosis or had eaten something disgusting when he promptly lent forward and breathed on me. Needless to say I didn’t recline fully! I must’ve have slept, though doing so in a room with near on a hundred other people (how often in your life do you do that!?) was awoken frequently. The cabin lights were turned on at 05:45 with a PA announcement that we were about to dock and disembarkation would be at 06:30. Again, I didn’t bother trying to do breakfast on board and attended to what ablutions I could in the circumstances. Suffice to say, I didn’t arrive at Devonport feeling particularly fresh. It was still dark as I found myself dockside with no real clue where to go next. 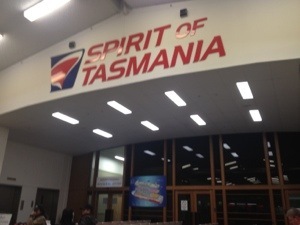 I’d sorted out my ticket for the Tassielink bus to Hobart the night before, through the Spirit of Tasmania’s on-board tourist office (paying $50 instead of the walk up rte of $56.60, so that was a good move!) but that wasn’t due until 07:45. I followed my nose out of the terminal and found the Dockside Cafe for a very welcome coffee and some toast. The bus was waiting outside the terminal on my return, and a very cheerful & helpful driver commenced to look after me and my fellow Hobart-bound passengers. As dawn broke, it revealed a wet, grey and – frankly – miserable Devonport. The docks area isn’t the best introduction to a place, but when we went around to the town side of the river – outwardly at least – it looked little better. We picked up a handful of passengers there, mostly regulars taking the hour long ride to Launceston. The journey along the main highway to there was still grey, and the view not particularly appealing, so I cat napped for most of it. The weather had taken a definite turn for the better by the time we had our 15 minute layover in Launceston’s Cornwall Square terminal – time for a quick leg stretch etc. Then off for the longest part of the journey, the 160km and nearly 2½ hour drive to Hobart through the “Midlands”. This was more scenic, though as the little bus and its luggage trailer batted down the single carriageway road, often at or around the 110km/h speed limit, it was a little uncomfortable at times. This was aggravated by me still being sleep-deprived and constantly nodding off. I managed to convince myself that the driver was doing the same and expected to head off into a ravine at any moment. All of which was grossly unfair as, although quick, his driving was otherwise faultless. Just the mind playing tricks. I was still glad to plant my feet on tarmac in Hobart. Again, the Tassielink terminal is well geared-up for travellers and hold luggage free of charge, which I elected to do rather than find the hotel straight away. So I set off into Hobart’s CDB. It’s a capital city of course, but it has no real pretensions of being more than pretty port town – or at least that’s the impression I’ve gained in the 24 hours I’ve been here. The tag line I’ve quoted above certainly hints at a laid-back pace. Before long I found myself at the tourist information office. I’d been bombarded with Tassie tourist leaflets, both on the ferry and on the bus, all of which were helpful in orienting myself. Almost on a whim, however, I found myself booking a 13:30 bus trip to Mt Wellington. This is the 1,270m (4,166ft) peak which overlooks Hobart and much of southern Tasmania. It was a beautiful sunny day in Hobart and this seemed to neatly satisfy my ongoing need to find high places from which to look at a city. After passing a little more time exploring on foot it was time to board the bus. Another helpful, informative and naturally friendly driver passed the 45 minute drive up the mountain with an unforced (and clearly unscripted!) commentary. Arrival at the top was, unquestionably, another big Wow moment (I’m losing count of the number of them in the trip so far!). Despite a bit of haze in the long distance, I’d picked a perfect day for going up there, though the wind (the ‘roaring forties’ we were told??) certainly added to the “breathtaking” part of it. Though the view southwards, over Hobert and its suburbs into the southern ocean was remarkable enough, it was sobering to look north-west, across the barren rocky plateau, in the knowledge that there is 200 miles of that to the corner of the island, filled with absolutely NOTHING. In fact, you could walk 95 miles due west to the coast and not even cross a road! Although only, to quote our driver/guide, “if you made it”. Stunning, and one of the better spur-of-the-moment decisions of the holiday. Back down to Hobart and having collected my bag I found the hotel and checked in. It’s just on the outer fringe of the CDB and is a really good hotel – thank you Expedia. Another friendly welcome and a faultless king sized room. I did have a moment’s wobble as the room is accessed from a corridor which is fully glazed to one side, offering a view out to the city, with the rooms a step up on the other side. Hard to describe adequately. I’m sure there’s a good reason, architecturally, for this, but for a few brief seconds, it put me in mind of the ‘pod’ style rooms plonked in cheap brands like Etap etc. Nothing could be further from the truth though. One unusual feature of the room, which is probably a vision of the future, and certainly reflect’s Tasmania’s ‘green’ outlook, is a recycling bin in the room! Oh, and it’s got free WiFi in the room. Take that, Parkview! One of the little tasks I undertook while having five minutes or so R&R, was to do a bit of photo housekeeping. It may interest you to learn that to this point I have taken 3,788 photos and 34 video clips (a total of 16.6Gb). Those of you who want a viewing when I return, form an orderly queue…. Having got myself organised, I did a Google search for ‘Craft Beer Hobart’. One of the top hits was this link, featuring a place called Preachers. It was a bit of a trek from where my hotel is located, made longer by my embryonic grasp of Hobart geography. When I found it, I really wasn’t sure what to do as it looked like (it is, in fact) simply a converted house. The front door had ‘Open’ on it, so I went in. I’d hit the jackpot as far as beer was concerned, and there was even something on the tapas menu I could eat for dinner (meatballs – surprisingly good, despite the foodie friendly description!). I sampled brews from two Tasmanian micros; Two Metre Tall and Van Dieman, very good they were as well. The place was far from busy, which suited me but probably wasn’t good from their point of view. I guess even in paradise, Tuesday nights are quiet. Having had my fill, which at $11 pints came fairly quickly, I wandered back through the quiet harbour area. Given this is ‘tourist central’ for Hobart and it was only 19:30, the onset of winter season was clearly an element. My, much shorter, route back to the hotel took me past a ‘Bottle-o’, so I stuck my head in to see their choice. It wash’t bad and I felt obliged to buy a pair of Two Metre Tall brews for the room. One was called Derwent (which is the local river! ), an “aromatic spelt ale” or wheat beer, and the other was Huon (another river, I think) a “dark apple ale”. I’m thinking Carl would like these!! So that was Monday. Tuesday is another sunny day, though deceptively chilly. I’ve spent the morning in a cafe on the harbour side called Tasmania Mures, which provided breakfast and very drinkable coffee – and free WiFi. Most of all they’ve provided a decent view out of over the sunny harbour to form the backdrop as I’ve typed this. Completing a full house of transportation methods (or at least mainstream ones, can’t see me helicoptering anywhere ), I’m about to board the Spirit of Tasmania I, bound for Devonport, Tasmania. I’m not confident of a strong WiFi signal in the Bass Straight (though I note there’s an “Internet Cafe” – how very 1990s!). The point being, you’ll have to wait until tomorrow before you’ll get to hear about today – and that’s without worrying about time zones. We sail at 19:30 Mon and arrive 06:00 Tue. Carl has gone back to Canberra, some trivial excuse about seeing Deb & the girls and earning a living to support them. I hesitate to call him a lightweight as he’s put up with me for two and a half weeks, almost unbroken, which must count for something! It means, however, I have several days looking after myself now….